Now this is our family recipe and this is how we do it. It is one of our favourite recipes, tastes amazing and a firm family favourite. The sauce takes a while to cook and should simmer for at least 3 hours to develop the flavours and make it a deep, rich sauce. A lot of people we talk to when cooking with wine always say they use cheap wine for sauces, this is something we do NOT agree with and has always baffled us. If the wine isn’t good enough to drink, it isn’t good enough to go into our food. Use tagliatelle pasta with this dish as it holds the sauce a lot better than spaghetti. Heat the oil in a large sauté pan and fry the garlic for a few minutes until golden, then crumble the meat between your fingertips and add to the pan and fry until brown – around 10 minutes. Add the red wine and simmer for a further 5 minutes until it has reduced. Once cooked, remove from the hob, taste and season with salt and pepper again if needed. When ready to serve, bring a large pan of water to the boil and season generously with salt, always remember the water should be as salty as the Mediterranean Sea. Add the pasta to the pan and cook until al dente. Drain the pasta, then return the pasta to the pan with the sauce and toss to combine well. Always do it this way and never serve the pasta with the sauce just plonked on top. The pasta and sauce need to be mixed and combined well together in the pan were the sauce was cooked to get the best flavour. 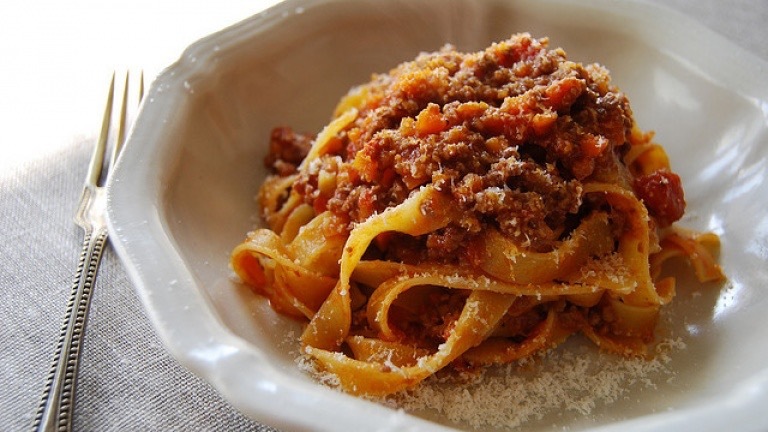 Serve with Parmigiano Reggiano… Buon Appetito a tutti.